Tail Blazers - Franchise Opportunities - Why Choose Tail Blazers? Tail Blazers FranchiseWhy Choose Tail Blazers? Tail Blazers has been helping improve the health of pets by supplying the best, natural foods available since 2000, long before it was the “in” thing to do! Tail Blazers’ unwavering commitment since opening has been to supply quality, healthy, all-natural food for dogs and cats. We are a progressive company with a pledge to quality and education, and pride ourselves on being at the forefront of health for pets, responsible pet ownership, community involvement and environmental stewardship. Some of the benefits of being part of Tail Blazers are: franchise marketing, a comprehensive and educational website, vendor discounts, electronic inventory, lowest franchise royalty fees in the industry and our inclusive support system. We want to help you get established in your new location, so there are no franchise royalty fees for the first 6 months you are open. Additionally, Tail Blazers has some of the largest and best displayed freezers for raw food and the knowledge to support it. We also lead the industry with the active use of online marketing, social media and other unique tools such as our mobile app help to spread the word to customers about pet health and food. Success has come from Tail Blazers’ passion and experience for health and pets, business expertise, extensive product research, knowledge and hands on skills acquired while working with pets on a daily basis. We want to help you have that same success. WHY THE NATURAL PET FOOD INDUSTRY? 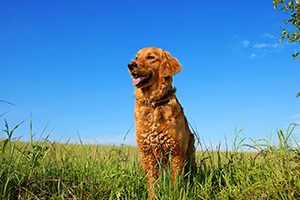 The natural pet industry has seen substantial growth, despite the economic state. According to Pet Food Industry.com, natural pet food sales grew by a compound annual growth rate of 12.1 percent between 2012 and 2016. This trend is similar in Canada and expected to continue. In Canada, approximately 57% of households have a pet - that is about 5.9 million dogs and 7.9 million cats to feed, with an upward trend for healthy foods! In addition, healthy and natural food/treats = healthy pets. Healthy pets are happy pets and it is satisfying to have the opportunity to improve the lives of, and ultimately add years to the lives of companion pets. 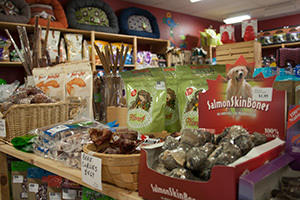 Pets will only find healthy and natural food and treats at Tail Blazers. Healthy food for pets does NOT mean it contains unusual ingredients, tastes "bad" or is a big pile of "weird" greens in a salad, images often associated with health food stores for humans. Healthy pet food DOES mean that it is the food closest to what the ancestors of domestic dogs and cats ate, otherwise known as species appropriate foods. Species appropriate foods are health-promoting foods, reducing disease, improving energy, increasing dental health and enriching the skin and coat. In addition to species appropriate ingredients, high quality, human grade ingredients are also part of the health food philosophy Tail Blazers employs. Natural supplements for side-effect free treatment of ailments, improved digestion, joint support and much more also help pets have improved health and quality of living. Every food, treat and supplement sold in Tail Blazers goes through a rigorous quality screening analysis prior to it going on the shelf. We are committed to ensuring pets get the healthiest choices available on the market. 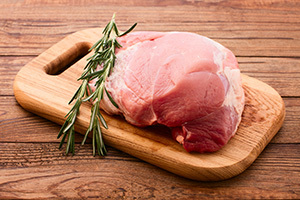 Products are analyzed for biologically appropriate ingredients (eg: NO foods with corn, soy or artificial colours), nutrient profiles, manufacturing processes (such as quality control, temperature of processing, bacteria/mold testing, ingredient handling), ingredient sources (human grade ingredients from reliable farms and companies), company integrity and environmental stewardship and overall formula of the product. We are not afraid to pull products off the shelf that no longer comply with our quality standards and we do not have double standards (promote health, but carry unhealthy products)! Pet guardians can rest assured they are only getting quality, natural and healthy products at Tail Blazers, all the time. This commitment to quality helps solidify a long standing relationship of trust with pet parents. One of the core values of Tail Blazers is education. By doing extensive product and business operations training to franchisees, our goal is to make your store successful by passing on our years of experience and research. You in turn can pass on your knowledge to customers so they can feel informed and educated about their purchases, building relationships and loyalty. Training is done in-store and includes inventory management, day-to-day operations, point-of-sale system, product selection best suited for your store demographics, complete nutrition and product training and of course answer all the questions you may have. Extensive training manuals that include detailed product information, computer systems and customer support are supplied. Whether your experience with pets and retail is minimal or extensive, we will make sure you are prepared and confident for your new business in the pet industry. We are committed to helping you grow and flourish in your business. Beyond the initial training, our experienced team is happy to assist with day-to-day questions that may arise, troubleshooting, customer retention and marketing strategies. The franchise support team will ensure your franchise experience is personable - you can contact franchise staff at anytime and expect a personal response with questions addressed in relation to your particular situation and location. We are here to facilitate a profitable Tail Blazers business for you! WHO ARE TAIL BLAZERS FRANCHISE OWNERS? Tail Blazers franchise owners are just like you! They have a passion for the well being of animals and the drive and determination to improve the quality of life of our pets. They are people who get to earn a living doing what they love! Franchise owners find it incredibly rewarding to see the dramatic changes and transformations in so many pets on a daily basis as a result of the products and suggestions they make to their customers! 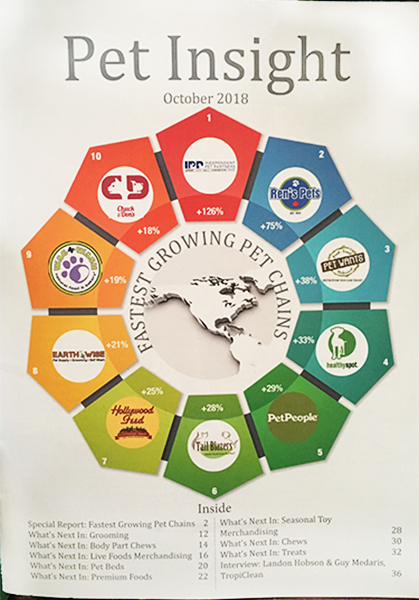 The October 2018 issue of Pet Insight named Tail Blazers the 6th fastest growing pet chain in Canada/US! Join us on the quest to provide pets the healthiest food and treats available! Becoming a Tail Blazers owner was the best decision I’ve ever made! I started learning about holistic health and nutrition about 5 years ago, and when I decided I wanted to own my own store I needed to find one with the same beliefs and principles that I had! Tail Blazers has extremely high standards, and strict approval processes for which foods, treats, and all other products are allowed to be carried. This provides tremendous peace of mind for myself and all of my customers! I know once I’ve been told a product has been approved I don’t have to think twice about it because of how stringent the approval process is! It takes any guess work out of shopping from a customer perspective as well! While head office is very strict about investigating all of our products, they are also very encouraging of individuality at each location! They understand that we as owners are all different people, and each location will have different sales trends. We have complete freedom to pick and choose our inventory from our approved products list! This is great because it allows owners to adapt to changing trends in their own stores! The support and availability from head office is second to none, there’s always someone to answer a question, or help solve any issues! Being able to call up the founder of Tail Blazers at any time and actually get him on the phone is so reassuring! As a Tail Blazers franchisee I’ve been able to grow my own unique store, while using the structure and expertise of an existing system. I have become a very successful business owner at a young age, and I would recommend to anyone who is serious about pets and their health to consider this as an incredible opportunity!! If you are interested in a Tail Blazers franchise and would like to view Tail Blazers store pictures, please request login information. For more information about owning a health food store for pets, please request a Tail Blazers franchise information package (no cost).